When Kenya’s 2007 elections were disputed, the country catapulted into chaos. 800 to 1,500 people were killed, and a whole generation of youths was left scared and without guidance. The challenging environment inspired Rob Burnet, an expat who has been in Kenya since 1993, to establish Well Told Story – a research consultancy that is getting through to the hearts of Kenya’s adolescents and 20-somethings through lovingly crafted content. The company is most famous for Shujaaz. Meaning, ‘heroes’ in Sheng, a slang mix of English and Swahili, Shujaaz follows the story of 19-year-old DJ B, who runs a pirate FM station in his bedroom, and a motley crew of young Kenyans who tune in to his show and get involved with their own ideas. 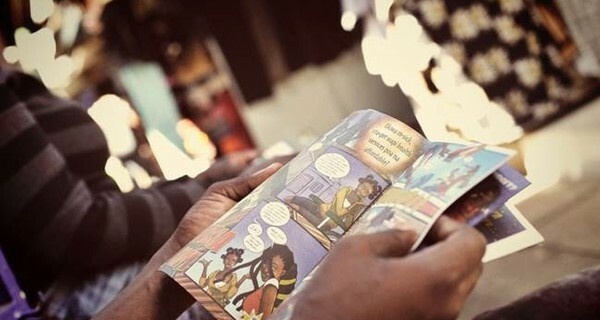 Launched in 2010, Shujaaz is a free, International Emmy-winning comic book with a monthly circulation of 500,000, and a readership that Burnet estimates to be five million Kenyans aged between 10 and 25. The comic is part of a whole world that also includes a daily FM radio show, Facebook accounts, YouTube videos and SMS text messages, with content produced by young people in Well Told Story’s office in Nairobi. Crucially, by providing a fascinating story focused on topics teenagers in Kenya care about – relationships, making money, and entertainment – Shujaaz can also educate. Each issue gives readers tips on everything from planting maize to contraception, information about upcoming elections and careers.